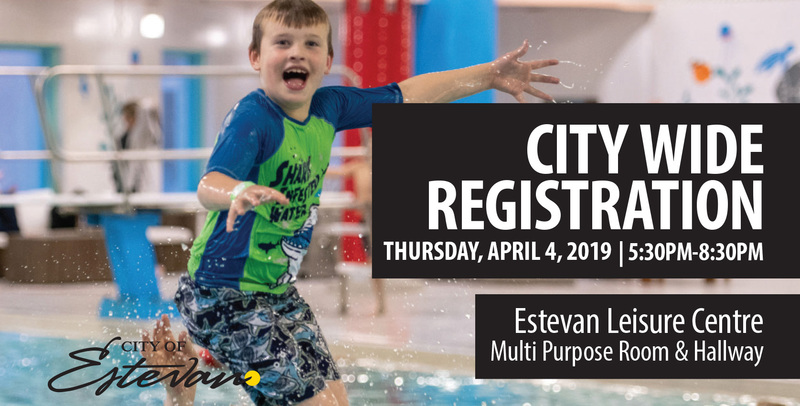 The City of Estevan Leisure Services Division would like to announce that City Wide Registration Night originally scheduled to be held on Tuesday, April 2nd from 5:30 to 8:30pm in the Multi Purpose Room and Estevan Leisure Centre hallway has been moved to Thursday, April 4th at the same time and location. City Wide Registration Night is well attended by Estevan residents wanting information about Adult and Children groups, organizations and activities that happen within our city. Red Cross Swimming Lesson online registration will be pushed back to April 4th at 5:30pm as well.